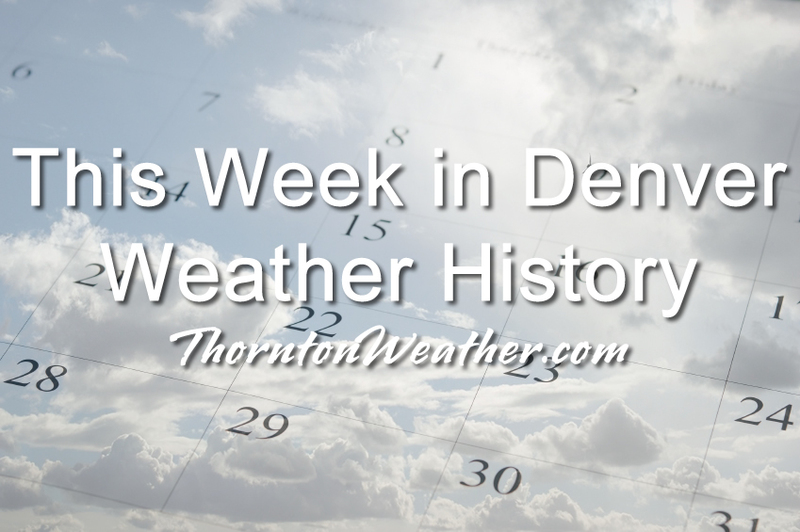 Denver’s February weather is usually relatively uneventful although that isn’t always the case as we can see from our look back at this week in Denver weather history. From extreme cold to major snowstorms and damaging winds, this period has seen some historically significant events. In 1985…a cold front on the 29th produced a protracted cold spell as arctic air remained entrenched across metro Denver. While the only daily temperature record set was a low maximum reading of 2 degrees on February 3rd…minimum temperatures plunged well below zero on 9 consecutive days. The coldest readings were 15 degrees below zero on January 31st and 14 degrees below zero on February 5th. In 1963…warm weather that began with the strong Chinook winds on the 31st and 1st continued through the 8th. Maximum temperatures through the period ranged from 52 degrees on the 2nd to 76 degrees on the 5th…which was a new record high for that date. In 1899…a protracted cold spell lasted almost two weeks. Low temperatures plunged below zero on all days but February 9th with a reading of 6 degrees. The coldest low temperature of 22 degrees below zero on February 6th was a record low for the date. Low temperatures of 20 degrees below zero occurred on both February 11th and 12th… But only the 11th remains as the record minimum for the date. High temperature of only 5 degrees below zero on February 11th was a record low maximum for the date. High temperatures climbed to only zero degrees on both February 2nd and 3rd…but were not records. Intermittent light snow or flurries fell during the period. The most snowfall…2.0 inches…occurred on February 2nd. In 1996…cold arctic air plunged temperatures below zero for more than 35 consecutive hours from late on the 1st until sunrise on the 3rd. The temperature warmed to only 1 degree below zero on the 2nd after a record low of 16 degrees below zero. In 2011…a frigid arctic airmass settled into Front Range urban corridor. At Denver International Airport… Overnight low temperatures…from the 1st to the 3rd… Were 13 below zero…17 below zero and zero respectively. The icy temperatures caused pipes to crack and burst following the freeze. In Loveland…firefighters responded to more than a dozen water pipe breaks…most in fire sprinkler systems at businesses…apartments and assisted care facilities. At cu earth science library in Boulder…more than 1000 books and several costumes for an upcoming production were damaged. At the County courts administration building in Jefferson County…a steady stream of water from a crack on the 5th floor… Went unnoticed on the 3rd and flooded all the floors of the administration wing overnight. As a result…much of the office equipment…furniture and carpet sustained water damage. A burst sprinkler line caused minor damage at the Platte Valley Medical Center in Brighton. The icy temperatures forced to closure of several school districts as well. In 1985…the most bitter cold spell of the winter season brought sub-zero temperatures to metro Denver. Daily low temperature records were broken at Denver. The usual cold weather problems struck including stalled vehicles…jammed traffic lights…and frozen water and sewer lines. At Stapleton International Airport…the high temperature was only 2 degrees above zero on the 1st…setting a record low maximum for the date. Low temperatures reached 13 below zero on the 1st…12 below on the third…and 14 below on the 5th. In 1989…one of the century’s worst doses of winter weather ravaged the entire state. Bitterly frigid weather moved into metro Denver on the 1st as snow buried many sections of the state. In metro Denver where 3 to 6 inches of snow fell…blowing snow and resultant poor visibilities caused a 46-car pile-up on I-25 in the middle of the city on the 4th. During the period…2 to 3 hour delays were common at Stapleton International Airport where snowfall from the storm totaled 4.3 inches and northeast winds gusted to 30 mph on the 1st. Intense cold accompanied the storm. Temperatures in Denver stayed below zero continuously for the best part of 3 days (3rd…4th…5th)…for a total of 69 hours. This is the fourth longest sub-zero period on record. Wind chill temperatures reached 50 degrees below zero. The mercury dipped to 24 degrees below zero on the 5th…setting a record for the date. This was the city’s coldest temperature in over 26 years. Low temperatures dipped below zero on 8 consecutive days (2nd-9th). High temperature of 9 degrees below zero on the 4th was a record low maximum for the date…as was the high of 5 degrees on the 5th. Extensive damage occurred when pipes and water lines froze and broke. Thousands of cars failed to start. On the 3rd…a 57-year-old woman died of hypothermia in an Arvada park. Eighteen high school students were treated for hypothermia after a 2-hour ride through Jefferson County in an unheated bus. At least 2 cases of frostbite were reported; there were undoubtedly many more. In 1883…a protracted cold period occurred when low temperatures dipped below zero for 9 consecutive days. Low temperatures ranged from 22 degrees below zero on the 4th to 2 degrees below zero on the 1st and 6th. High temperatures ranged from 10 below zero on the 3rd to 23 on the 9th. Several temperature records were set that still stand today. Record lows of 18 below and 22 below zero occurred on the 3rd and 4th. Record low maximum readings of 2 below and 10 below zero occurred on the 2nd and 3rd. The high of only 10 below zero on the 3rd is the coldest maximum temperature ever recorded in Denver. In 1894…6.2 inches of heavy snowfall were measured over downtown Denver. East winds gusted to 25 mph on the 2nd. In 1999…a powerful Chinook windstorm struck the foothills and adjacent plains. Several locations registered wind gusts in excess of 100 mph…including: 127 mph atop sugarloaf mountain…120 mph at Lafayette…119 mph at Wondervu…104 mph at coal creek…103 mph at the Rocky Flats Environmental Test Facility and 100 mph in Louisville. The damage associated with the windstorm was extensive. Thirty 70-foot-tall power poles were damaged… Including several that supported high voltage lines transmitting electricity directly from generating plants. The combination of downed power poles…power lines…and trees resulted in outages for about 10 thousand residents. In Lafayette…power poles were sheared off for a mile and a quarter. The power outages primarily affected residents in Boulder…Broomfield…Lafayette…Louisville… And Fort Lupton. In addition to the outages…high winds ripped apart several roofs in Boulder…including the roof of the Boulder County jail. At Jefferson County Airport… Several planes were overturned and some hangars damaged or destroyed. Damage to the airport alone was estimated at 100 thousand dollars. In southern Jefferson County… Localized ground blizzards reduced visibilities in blowing snow to less than 20 feet along U.S. Highway 285…resulting in several accidents. In Pine Junction a downed tree damaged a nearby residence…when it crashed onto the roof. In Bailey…a downed tree crushed a vehicle parked in the resident’s driveway. Total damage estimates for the windstorm reached 3 million dollars…making it the fourth costliest on record at the time in Colorado. Other peak wind gusts include: 97 mph at Boulder…93 mph at the National Center for Atmospheric Research mesa lab in Boulder… 88 mph at Nederland…86 mph at Aspen Springs…and 83 mph at Blue Mountain near Coal Creek Canyon. West to northwest winds gusted as high as 46 mph at Denver International Airport. In 2012…a slow moving and powerful storm system brought heavy snow to areas in and near the Front Range foothills and Palmer Divide…with blizzard conditions over the northeast plains of Colorado. In the Front Range foothills…the snow piled up to over 4 feet in some areas. Across the Palmer Divide…the combination of snow and gusty winds resulted in road closures with snow drifts ranging from 2 to 5 feet in depth. Northerly winds 15 to 25 mph were common with gusts to 40 mph. Several snowfall records were also set in Denver. At Denver International Airport…12.5 inches of snow feet on the 3rd shattered the previous record of 7.5 inches for the date. It also set a new daily record for the entire month of February. A new 3-day record was also established for Denver. The 3-day storm total from February 2nd to the 4th was 15.9 inches… Which broke the previous record of 14.1 inches in 1912. Denver International Airport canceled more than six hundred flights. In addition…snow and blowing snow produced near zero visibilities…forcing officials to close the westbound lanes of interstate 70…between the Kansas state line and Denver…as well as the eastbound lanes from Denver to Limon. Other road closures included State Highway 86…between Kiowa and I-70. Across the urban corridor storm totals included: 22 inches in Broomfield; 21 inches at Lafayette…Louisville and Westminster; 20 inches at Northglenn; 19 inches at the national weather service in Boulder…Castle Rock…Centennial and Parker; 18 inches in Arvada…16.5 inches in Erie…13.5 inches near Longmont; 11 inches in Lyons and 10 inches in Frederick. Storm totals in the mountains and foothills included: 51 inches at Coal Creek Canyon…45.5 inches…4.6 miles northeast of Ward; 44.5 inches…3 miles west of Jamestown; 38 inches…3 miles north of Blackhawk; 37 inches…3 miles west-southwest of Conifer and 4 miles east-northeast of Nederland; 35.5 inches… 3.6 miles west-northwest of Boulder; 34 inches…5.2 miles east- southeast of Aspen Springs; 33 inches near Evergreen…32 inches at Genesee; 31 inches…10.3 miles west of Bellvue and Eldora Mountain Ski Resort; 24 inches at Echo Mountain Ski Resort; 21 inches at Niwot Ridge SNOTEL; and 19 inches at Gross Reservoir. Along the Palmer Divide storm totals included: 26 inches…14 miles east-northeast of Kiowa; 25 inches…10 miles south- southwest of Buckley Air Force Base…and 8 miles southeast of Watkins; 20 inches near Strasburg; 12 inches near Elizabeth. In 1883…the lowest daily maximum temperature ever recorded in Denver…10 degrees below zero…occurred. In 1885…a windstorm occurred from late morning through the late afternoon. Northwest winds were sustained to 45 mph in the city. In 1888…a trace of light rain fell in downtown Denver. Rain is relatively rare this early in the month. In 1924…northwest winds were sustained to 48 mph. These were the strongest winds of the month that year. In 1932…a major storm dumped 7.5 inches of snow in downtown Denver where northwest winds gusted to 23 mph. Boulder received 9 inches of snow from the storm. In 1906…northeast winds were sustained to 43 mph behind a cold front on the 3rd. The front plunged temperatures from a high of 62 degrees on the 3rd to a low of 24 degrees…which was also the high reading on the 4th. The low temperature on the 4th was only 3 degrees. Snowfall was only 0.6 inch on the 4th. In 1970…a wind gust to 115 mph was recorded in Boulder at the National Center for Atmospheric Research. Sustained winds of 35 mph with gusts as high as 62 mph were measured in downtown Boulder. Northwest winds gusted to 47 mph at Stapleton International Airport on the 3rd. In 1982…a cold surge of arctic air brought light snow and sub-zero temperatures to metro Denver. Temperatures plunged to 6 below zero at midnight on the 3rd and never warmed above zero on the 4th as snow flurries continued. High temperature on the 4th of 1 below zero was a record low maximum. The temperature dipped to a record low of 15 below zero on the 5th. In 1883…the temperature plunged to a low of 22 degrees below zero. In 1885…a windstorm occurred in the city during the afternoon and early evening. West winds sustained to 64 mph blew down several trees…chimneys…awnings… And sheds. Stronger winds in the foothills blew a train from the track at Georgetown…injuring several passengers. In 1890…the highest recorded temperature in February… 77 degrees…occurred. This temperature was equaled on February 28…2006. In 1898…west winds were sustained to 53 mph with gusts to 60 mph. In 1915…very strong northwest winds whipped downtown Denver nearly all day. There were 13 consecutive hours with maximum sustained velocities ranging from 27 to 44 mph. An extreme velocity to 46 mph was recorded. In 1952…a northwest wind gust to 48 mph was recorded at Stapleton Airport. Severe winds were reported west and north of Denver. In 1995…high winds developed in the foothills west and northwest of Denver. A gust to 97 mph was recorded on Squaw Mountain. Winds were clocked to 83 mph at Rollinsville. Wind gusts between 50 and 70 mph were common. North winds gusted to only 31 mph at Stapleton International Airport. In 1932…wind gusts estimated at 70 mph occurred in Boulder. A 60 mph wind gust was recorded to the east of Boulder in Valmont. Damage was minor. In 1959…heavy snowfall totaled 5.8 inches at Stapleton Airport where northwest winds gusted to 30 mph on the 4th. In 2001…high winds developed for a brief time overnight. Winds gusted to 75 mph atop the Gamow Tower on the University of Colorado campus in Boulder. Northwest winds gusting to 37 mph warmed the temperature to a high of 57 degrees at Denver International Airport. In 1986…10 inches of snow fell in Boulder…in the foothill town of Wondervu southwest of Boulder…and at Evergreen west of Denver. Snowfall totaled 2.4 inches at Stapleton International Airport…where north winds gusted to 20 mph on the 6th. In 1885…west winds were sustained to 42 mph in the city near daybreak. In 1902…northwest winds sustained to 48 mph with gusts to 53 mph warmed the temperature to a high of 53 degrees. In 2006…high winds developed briefly along the foothills… Extending from Golden to near Boulder. Peak wind reports included 92 mph at the national wind technology center on Rocky Flats with a gust to 84 mph in Golden. North winds gusted to 43 mph at Denver International Airport. In 2011…heavy snow fell in the foothills of Douglas… Jefferson and park counties. Storm totals included: 19 inches…3 miles southwest of Conifer; 17.5 inches…4 miles south-southeast of Pinecliffe; 14 inches…5 miles east-southeast of aspen park; 12.5 inches…7 miles southwest of Boulder and at Genesee; 12 inches at Strontia Springs dam…10.5 inches at Roxborough State Park; and 10 inches…3 miles east-southeast of Tiny Town. In the western and southern Denver suburbs and Palmer Divide…storm totals included: 9 inches near Louviers and 3 miles south-southeast of Morrison; 8 inches at Ralston Reservoir…7 inches in Lakewood…6.5 inches…2 miles southeast of Highlands Ranch and 6 inches in Englewood. Snowfall totaled 1.2 inches at Denver International Airport. In 2003…heavy snow fell in the foothills. Snowfall totals included: 17 inches at Genesee; 16 inches at Lookout Mountain; 11 inches at Chief Hosa near Indian Hills…and 7 miles southwest of Boulder; 10.5 inches atop Gold Hill; and 10 inches at Intercanyon and near Conifer. Only 2.2 inches of snowfall were measured in the city at the site of the former Stapleton International Airport. In 1978…the 5th marked the start of a record 7 consecutive days of dense fog at Stapleton International Airport. The heavy fog reduced the visibility to 1/4 mile or less for a period of time on each of these days. Light snow and/or freezing drizzle occurred on most days. Fog reducing visibility to less than 7 miles was recorded at Stapleton International Airport on 11 consecutive days through the 15th. During the period 5-14…the cold thick fog deposited heavy rime ice up to 5 inches thick on power lines and poles over a wide area of eastern Colorado…causing a major electrical power outage disaster. In 1899…the temperature dipped to a low of 22 degrees below zero. In 1929…5.0 inches of snow fell in downtown Denver behind a Canadian cold front. Temperatures plunged…but no records were set. Low readings dipped to 3 degrees below zero on the 6th and 9 degrees below zero on the 7th. Highs climbed to 5 degrees on the 6th and to only 1 degree below zero on the 7th. In 1933…post-frontal light snowfall totaled 3.0 inches over downtown Denver. Northeast winds were sustained to 28 mph with gusts to 32 mph on the 6th. The very cold air mass plunged temperatures from a high of 60 degrees on the 5th to lows of 10 degrees below zero on the 6th and 16 degrees below on the 7th. High temperature of only 4 degrees below zero on the 7th was a record low maximum for the date. In 1933…3:00 pm on the 6th marked the start of a protracted cold period through 8:00 am on the 10th when the temperature was below zero for 86 out of 88 hours. The cold period was interrupted on the 8th at 9:00 am when the temperature was 1 degree above zero and at 10:00 am when the temperature was 8 degrees above zero. Four temperature records were set. High temperatures of 4 degrees below zero on the 7th…8 degrees on the 8th…and 5 degrees below zero on the 9th were record low maximums for those dates. The only record low temperature record was 14 degrees below zero on the 10th. The lowest temperature reached during the period was 16 degrees below zero on both the 7th and 8th…which were not records. In 1940…a distant thunderstorm was recorded. This was only the second ever recorded in the city during February since 1900. In 1976…strong Chinook winds were reported along the foothills with sustained winds at 46 mph and gusts to 69 mph at the National Center for Atmospheric Research in Boulder. Wind gusts of 70 to 90 mph were recorded at other locations in Boulder. Northwest winds gusted to 44 mph at Stapleton International Airport. In 1979…strong west winds gusted as high as 99 mph near Boulder. The winds caused ground blizzards that closed several highways around Boulder. Some cars were forced off the road…and a truck was overturned. Wind gusts of 50 to 80 mph were common in and near the foothills. Northwest winds gusted to 33 mph at Stapleton International Airport. In 1988…a wind gust to 82 mph was clocked at Rollinsville in the foothills southwest of Boulder. In 1999…strong Chinook winds developed in the foothills. Peak wind reports included: 90 mph at the National Center for Atmospheric Research mesa lab near Boulder and 88 mph at Wondervu in the foothills southwest of Boulder. West to southwest winds gusted to only 48 mph at Denver International Airport. In 1936…a sharp blast of frigid arctic air was of short duration. At 11:00 am on the 7th the temperature was 39 degrees…but dropped to only 1 degree within an hour. A more gradual decrease occurred through the night to a low temperature of 25 degrees below zero shortly after 6:00 am on the 8th. This was the lowest temperature ever recorded in February. (the record was equaled on February 1…1951.) Snowfall of 1.0 inch occurred in the cold air. During the day on the 8th…northwest Chinook winds from 12 to 16 mph…and as high as 21 mph warmed the temperature to a high of 35 degrees at 7:00 pm. This was a rise in temperature of 60 degrees in 13 hours. Unofficially…the temperature dipped to a low of 30 degrees below zero at Denver municipal airport on the morning of the 8th. In 1956…5.5 inches of snow fell at Stapleton Airport where east-northeast winds gusted to 23 mph on the 7th. In 1980…an upslope storm dumped 4 to 10 inches of snow over the plains and as much as 22 inches in the foothills. Traffic was snarled and some schools were closed. Two runways were closed for 3 hours at Stapleton International Airport…where snowfall totaled 6.5 inches and north winds gusted to 25 mph. Most of the snow fell on the 7th. In 1886…northwest winds were sustained to 40 mph in the city. The strong winds were accompanied by a cold wave. In 1905…west winds were sustained to 40 mph behind a cold front. The bora winds warmed the temperature to a high of only 38 degrees and produced a trace of snow. In 1939…the very light snowfall…which began during the morning…contained unusually symmetrical…flat and dry snow crystals. These snow crystals continued to fall all afternoon. Snowfall was only a trace. Temperatures ranged from a low of 7 degrees to a high of 18 degrees. In 1942…a major storm dumped 8.0 inches of heavy snow on downtown Denver. North winds were sustained to 17 mph. In 1981…high winds occurred over the eastern foothills with 72 mph reported atop Squaw Mountain west of Denver and 60 to 70 mph winds at other locations in the foothills west of Denver. Wind gusts to 50 mph were reported in Boulder. Northwest winds gusted to 39 mph at Stapleton International Airport. In 1898…rain changed rapidly to snow during the late evening of the 8th and continued through the early afternoon of the 9th. Snowfall totaled 6.0 inches in the city. Northeast winds were sustained to 26 mph with gusts to 30 mph on the 8th. In 2001…heavy snow fell across metro Denver mainly in and near the eastern foothills. Snow totals included: 12 inches atop Crow Hill and near Evergreen; 10 inches in Evergreen and near Morrison; 9 inches at Genesee; 8 inches atop Lookout Mountain and near Littleton and Bailey; 6 inches at Arvada and Ken Caryl Ranch; and 5 inches in Broomfield…Chief Hosa… And Thornton. Snowfall totaled 5.1 inches at the site of the former Stapleton International Airport. Temperatures dipped to 15 degrees below zero at Denver International Airport on the morning of the 9th…setting a new record minimum for the date. In 2002…high winds in the foothills on the 8th spread over the plains on the 9th and caused much blowing dust and snow and blizzard conditions east and northeast of metro Denver. I-70 was closed from just east of Denver to the Kansas state line. Zero visibilities coupled with snowpacked and slick roads caused multiple car accidents in southern weld County. High winds developed in the foothills on the 8th with gusts to 71 mph on Rocky Flats and to 75 mph at the National Center for Atmospheric Research mesa lab in Boulder. The high winds continued on the 9th with gusts to 83 mph near Fritz Peak…70 mph at Evergreen…and 67 mph at Parker. Northwest winds gusted to 55 mph on the 8th and to 58 mph on the 9th at Denver International Airport where the surface visibility was reduced to as low as 1 mile in blowing dust on the 9th. In 2008…strong downslope winds developed in and near the Front Range foothills. Peak gusts included: 88 mph at Georgetown…85 mph at Berthoud Pass…81 mph at the NCAR Mesa Lab…78 mph at the National Wind Technology Center… At 76 mph at Floyd Hill. At Denver International Airport… Gusty west winds to 48 mph were observed on the 8th. In 1886…north winds were sustained to 42 mph…the highest winds of the month that year. In 1893…northwest bora downslope winds were sustained to to 40 mph with gusts as high as 70 mph in the city. In 1960…the lowest pressure reduced to sea level ever recorded in Denver…28.83 inches (976.4 mb.)…occurred. The actual station pressure of 23.770 inches was also the lowest ever recorded. In 1967…northwest winds gusted to 51 mph at Stapleton International Airport. Winds were strong and gusty all day. In 1988…high winds occurred in and near the foothills. Winds gusted to 96 mph in east Boulder. As many as 1600 homes lost power when wires were downed by the wind. Some windows were blown out of cars near Rocky Flats south of Boulder where winds were clocked at 85 mph. In Broomfield…winds were recorded to 68 mph at Jefferson County Airport. In 2009…high winds occurred in and near the foothills of Boulder and northern Jefferson counties. Peak wind gusts included 81 mph at the national wind technology center and 6 miles northwest of Boulder. In 1934…rain changed to heavy snow on the afternoon of the 9th and continued through the day on the 10th. Snowfall totaled 7.4 inches in downtown Denver. North winds were sustained to 24 mph on the 10th. In 1972…heavy post-frontal snowfall totaled 6.2 inches at Stapleton International Airport where northeast winds gusted to 46 mph on the 9th. Temperatures plunged from a high of 51 degrees on the 9th to a low of 16 on the morning of the 10th. In 1981…the season’s coldest arctic air mass rolled into metro Denver plunging temperatures from 10 below to 20 degrees below zero. Bitter north winds gusting as high as 36 mph sent wind chill temperatures to 50 below zero. Two to four inches of snow fell over metro Denver with 6 to 12 inches in the foothills. A Boulder man died of hypothermia while cross country skiing in the mountains west of the city. Snowfall totaled only 1.5 inches at Stapleton International Airport where the minimum temperature on the morning of the 10th was 5 degrees below zero. The temperature that day warmed to a high of only 9 degrees. In 2003…high winds occurred in and near the eastern foothills. The highest wind gusts recorded: Included 80 mph atop Fritz Peak and 73 mph atop Blue Mountain and at the National Wind Technology Center on Rocky Flats south of Boulder. At least 4 multi-car accidents occurred along State Highway 93…between Golden and Boulder when blowing snow caused whiteout conditions. Northwest winds gusted to 36 mph at Denver International Airport on the 10th. In 1965…heavy snowfall totaled 6.2 inches at Stapleton International Airport where northeast winds gusted to 25 mph. In 1993…the same storm that dumped heavy snow in the mountains combined with an arctic cold front to produce heavy snow across metro Denver. Upslope snows of 4 to 8 inches were common with some areas receiving nearly a foot. Ten inches of new snow were measured in Parker and 7 inches in southeast Denver. At Stapleton International Airport… Snowfall totaled 8.1 inches. Strong winds combined with the snowfall to produce near-blizzard conditions over the plains closing many roads east of Denver. North winds gusted to only 18 mph at Stapleton International Airport on the 9th. This entry was posted on Tuesday, February 5th, 2019 at 6:01am MDT and is filed under Weather History. You can follow any responses to this entry through the RSS 2.0 feed. You can skip to the end and leave a response. Pinging is currently not allowed.